Hyderabad/Mumbai: India is headed for an exponential increase in digital payments over the next four years, according to a new study by Google (Alphabet Inc.) and Boston Consulting Group released on Monday. The digital payments industry in Asia’s third-largest economy will grow by 10 times to touch $500 billion by 2020 and contribute 15% of gross domestic product (GDP), the report predicted. Ever-increasing penetration of smartphones, the entry of several non-banking institutions offering payment services, consumer readiness to adopt digital payments, progressive changes in the regulatory framework will power the trend, it said. “Spurred by smartphone penetration, and supported by progressive regulatory policy, the digital payments industry is at an inflection point and is set to grow 10x by 2020," said Rajan Anandan, vice-president of Google, South-East Asia and India. “It is telling that half of India’s Internet users will use digital payments and that the top 100 million users will drive 70% of the GMV (gross merchandise value)—a clear indicator of the growing importance of the digital consumer," Anandan added. The contribution of non-cash modes of payments, i.e. 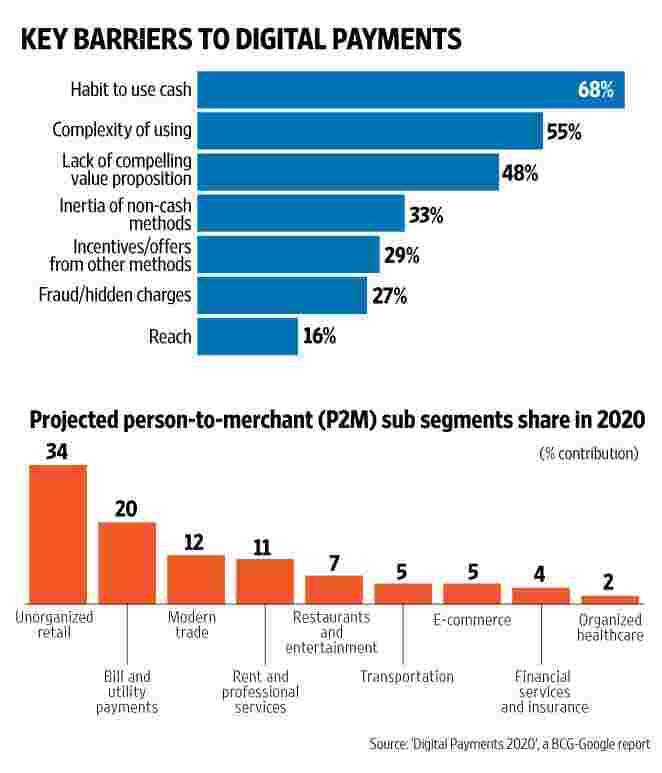 cheques, demand drafts, net-banking, credit/debit cards, mobile wallets and unified payment interface (UPI), is seen doubling to 40% of the consumer payments segment by 2020. Non-cash transactions will exceed cash transactions in the economy by 2023, the report forecast. The trends should benefit a plethora of start-ups in the digital payment space as well as traditional banks, promote online commerce and boost financial inclusion in India. Online shopping, utility bill payments and movie ticket purchases were identified as the top three services for which Indian users make digital payments. Online payments through digital wallets and debit/credit cards have been emerging as a preferred transaction mode over the past few years, mainly due to the ease of transaction, availability of smartphones and affordable Internet, and enhanced security and encryption methods, which led to greater confidence among customers. Online ticketing firms, such as IRCTC (railways), Makemytrip, Yatra, Cleartrip (airlines), redBus and Abhibus (buses) and Bookmyshow (movie and event ticketing) also played a crucial role in giving a leg-up to digital payments by getting customers to transact online. Digital transactions began booming after the advent of e-commerce firms, such as Flipkart, Snapdeal, Amazon, Myntra, Jabong and others, that began offering attractive discounts to woo customers. As smartphone penetration increased in the country, mobile wallet companies, such as Paytm (One97 Communications Ltd), Mobikwik (One Mobikwik Systems Pvt Ltd), Oxigen Services (India) Pvt. Ltd, Citrus Payment Solutions Pvt. Ltd, Freecharge and others, sought to make life easier for consumers by encouraging them to store money in their online wallets to transact more easily. Convenience has emerged as the most important factor that is driving this growth, followed by availability of offers, while opting for digital payment methods, the report noted, adding that Indian consumers are 90% as likely to use digital payments for both online and offline transactions. Some digital wallet firms such as PayTm, Mobikwik and Freecharge are now encouraging their customers to transact using their mobile devices at select local grocery stores, restaurants and petrol filling stations in the offline world. These offline points of sale will contribute to 60% of digital payments eventually, the report said. But ensuring universal acceptance of digital payment methods and reliable speed of transactions during peak hours are two key concerns highlighted by merchants which could inhibit their growth and usage. The Indian digital payments story will be dominated by micro-transactions, which will form a substantial portion of the industry. Over 50% of person-to-merchant transactions are expected to be under ₹ 100. The report predicts that the value of remittances and money transfers that will pass through alternate digital payment instruments will double to 30% by 2020. A bulk of small ticket transactions, which take place in retail, are not digitized because of poor acceptance network in India, said Govind Rajan, chief executive officer of Freecharge. There are only 1.2 million point-of-sale (POS) terminals in India, for example, compared to 13 million in the US. “With mobile becoming ubiquitous, these transactions will happen mobile-to-mobile. As a result, most small payments, which either have a problem of time or a problem of change, will actually move to mobile," Rajan said. “That will be the single biggest driver." The report, Digital Payments 2020’, is based on research conducted by researcher Nielsen AG with more than 3,500 respondents, combined with BCG and Google’s industry intelligence. Sure enough, digital payments have proved to be addictive. The study noted that 81% of existing digital payment users preferred it to other non-cash payment methods. Reserve Bank of India (RBI) data shows that mobile wallets have already surpassed mobile banking in volume terms. The volume of mobile wallet transactions doubled during April 2015-February 2016 period to cross ₹ 55 crore, noted M. Sinha, chief operating officer of Mobikwik, which sees its user base growing five times to 150 million in two years. “Mobile wallets are the first financial technology services or applications that they use as they are easy to operate, are secure, and in our case, also have a cash loading option," Sinha added. Sayan Chakraborty in Bengaluru contributed to this story.